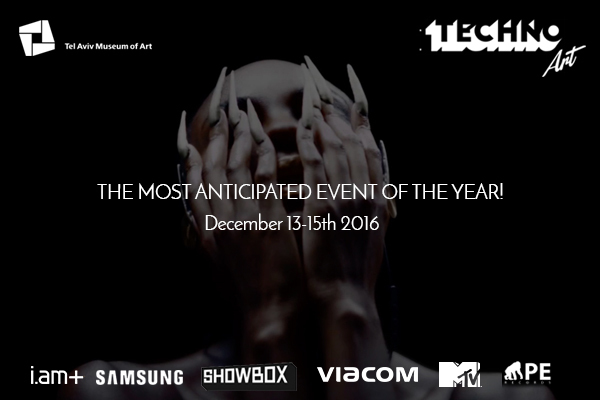 TechnoArt, an international conference on innovation and creativity, will take place in Tel Aviv, Israel on December 13th-16th 2016. The 3-day conference will celebrate the world of innovation in the digital era and will be hosted by the Tel Aviv Museum of Art. With thousands of participants from over 100 local and international companies, the conference will host artists, investors and industry leaders from around the world including Charles Renfro, the architect behind the High Line, the new wing of the Moma Museum and many other world renowned projects; Renowned music producer, owner of S-curve records and former president of Columbia Records, Steven Greenberg; SVP of Viacom Labs, Susan Claxton; and many more. The first day of the conference will focus on “Forming the Future”, from designing cities to the design of space and wearable technology. The second day will address the virtual world from IOT and interactive content to VR and Gaming. The third and last day will focus on the world of music. As part of the conference, a startup gallery will exhibit the latest disruptive startups in the field. Artists and industry leaders will share their success stories and KPMG will host a panel discussing investments in the disruptive world of content related technology. Every night at 11 PM the Tel Aviv Museum of Art will host the ‘Museum Comes to Life’ parties, presenting music performances, interactive exhibitions and the MTV Satellite Awards announcing the 2016 Satellite Awards winners. TechnoArt is Israel’s first art-related technology hub, and during the conference it will host its 2016 Demo day, presenting to the investor community the ventures that have been developed in the TechnoArt hub this year. The TechnoArt Conference is introduced by Socialterminals, a US-based investment firm focused on technological solutions that address distressed industries such as the world of artistic content. The firm, partnered with top international companies such as KPMG, PayPal, Howden and more, introduces a series of incubators focused on developing technological solutions for industries which have suffered a financial decline in the digital era. Socialterminals is focused on improving the world through innovation.